They say that women forget the pain of labor as soon as their children are born. Despite 17 hours of exhausting contractions, I have to say I found this to be remarkably true. Something I feel I'll always remember, however, is the jolt I received when an aspirating needle was inserted into my abscessed tissue after I developed mastitis, an inflammation/infection of the breast common in nursing women. Any mother with experience of the condition reading this will know I am not exaggerating when I say it is excruciating. "Poor cow," a sympathetic friend commented to me at the time. "Poor cows," I thought to myself as an animal welfare campaigner. Mastitis is endemic in dairy cattle: it is estimated that a typical UK herd has an average of up to 70 cases per 100 cows per year. It is such a prevalent problem, both in the UK and elsewhere, that the EU's regulatory limit for somatic cell counts in milk destined for the liquid market is set as high as 400,000 cells/ml. More simply said, there can legally be up to 400 million pus cells in each liter of milk you buy to pour over your cornflakes or into your tea. Above this limit, the milk is deemed unfit for human consumption. But somehow you're safe with 400 million pus cells. Or at least if the legal limit was set lower, the dairy industry would need to address the root of the problem, and that would involve more than just implementing tighter mastitis control plans. Mastitis, an inflammation of the mammary gland and udder tissue, is often caused by bacterial infection. It can be transmitted by contact with unhygienic milking equipment, contaminated hands, dirty housing or soiled bedding. Strict hygiene and good housing management are therefore important in helping to control herd mastitis levels. The incidence of mastitis can be further reduced by promoting good cow health through effective nutrition and by culling chronically infected cows. But things aren't so simple. The occurrence of mastitis is also linked to selection for high-yielding breeds and increased indoor housing. Around 80 percent of EU and 90 percent of US herds are now made up of (black and white) Holsteins, whose lives bear sadly little resemblance to the idyllic pastoral images many people still hold in their minds. They have been pushed to produce up to 50 liters per day, which is ten times more than they naturally would to feed their calves. It is difficult for them to sustain these excessively high yields on grass alone, and so they have increasingly been kept indoors, sometimes all year round, in "zero-grazing" systems where they are fed a "total mixed ration" of forage, concentrate and supplements. In such systems, cows have been shown to be more prone to mastitis than on pasture. Coupled with excessively high milk production, there is another factor aggravating cows' susceptibility to mastitis which has particular resonance with me as a breastfeeding mother. When my daughter was born, it didn't take long for me to learn that my comfort now relied on her frequent nursing. A little later, when I was admitted to hospital with an aggressive case of mastitis, I was repeatedly advised to keep breastfeeding regularly in order to alleviate the illness and help prevent its recurrence. Now with generally no more than two daily milkings, cows end up carrying around 20 liters in their udders. Again this is ten times more than they naturally would for their calves, who would feed five or six times a day. I cringe at the thought of a human equivalent. Not to mention that this also predisposes cows to lameness, as their voluminous udders splay their legs and put pressure on their outer claws. So dairy cows have a hard time of producing milk. But that's not all. Because they are (artificially) re-impregnated while still lactating from their previous pregnancy, they spend seven months out of 12 simultaneously pregnant and producing huge quantities of milk! This leads John Webster, Emeritus Professor of Animal Husbandry at Bristol University, to describe the modern dairy cow as "a supreme example of an overworked mother," "exposed to more abnormal physiological demands than any other class of farm animal." It is little wonder that, despite their natural lifespan of 20 years, today's dairy cows are typically worn out, and therefore culled, by their third lactation. And just when you think you've heard enough, there is one more painful fact that can't be avoided or understated. What kept me going through my long episode of mastitis was the satisfaction of knowing that, by breastfeeding, I was giving my baby the best possible start in life. To me that was worth any amount of pain and discomfort. 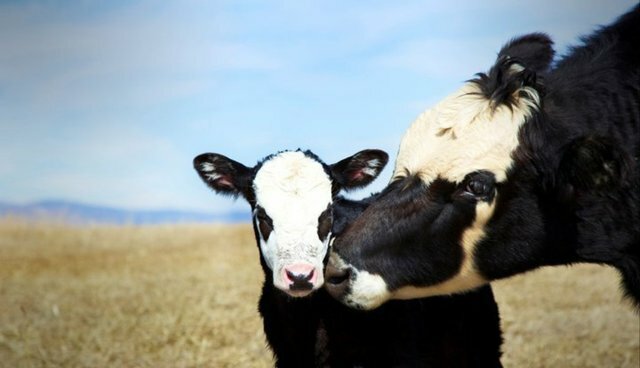 But of course, in order for their milk to end up in bowls of cornflakes or cups of tea (or cheese sandwiches or ice-cream cones), cows have to have their calves taken away a day or two after giving birth. And they don't feel any less traumatized by it than we human mothers would. Many male calves, which are of no use to the dairy industry, are actually shot within a few hours of birth. When I was advised to stop breastfeeding in order for my breast to be biopsied and I declined, partly on the grounds that I felt uncomfortable giving my baby the milk of another animal – who had worked harder than any other mother and yet been deprived of its young – while I was able to feed her myself (not every woman is so lucky), I knew I was being regarded as slightly on the eccentric side. If you've read this far, I'll let you be the judge of that.